Once a year, the world's best craft bartenders, taste makers, brand ambassadors, drinks writers, liquor sponsors, and cocktail aficionados plus a legion of media and public relations people descend on the New Orleans for a week of booze filled seminars, "spirited dinners", tough talking competitions, liquor tastings, and brand sponsored parties. Yes, it is time for Tales of the Cocktail again, the culinary and booze festival that is a bonafide CocktailCon for the industry. In past years, many of New York’s cocktail imbibers took the week off and substituted their daiquiris for a shot and beer. Their favorite drink slingers were partying it up in the Big Easy so why even bother? Fear not friends, times have changed as new generations of craft bartenders have expanded the city’s already deep bench of bartending talent. There will be no cocktail drought this year. In addition to a slew of young and up and coming bartenders, many veterans and legends will be in town this year. 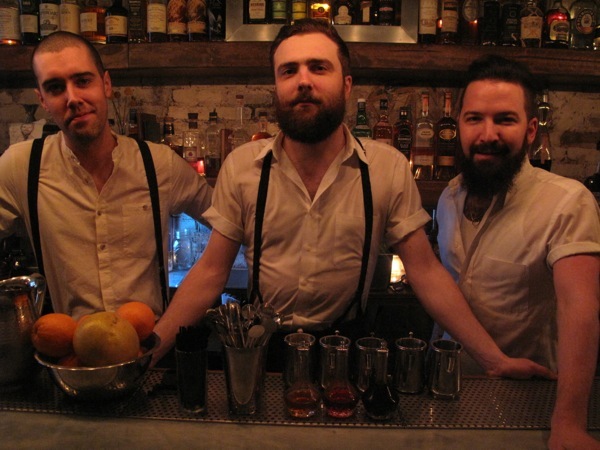 Attaboy (134 Eldridge Street) – Award winning barmen Sam Ross and Michael McIlroy are staying in town this year with their whole crew including bright boys Brandon Bramhall, Andrew Rice, and Dan Greenbaum. Expect lots of citrus forward seasonal cocktails and aperitifs. Clover Club (210 Smith Street) – Travis St. Germain, Ryan Lilila, and Pedro Rojas will be keeping Brooklyners wet with their delicious array of cocktails and small plates. Employees Only (510 Hudson Street) – The party never stops at EO, where Bratislav Glisic and Ulysses Vidal keep high volume cocktails flowing till the chicken soup is served. Macao Trading Company (311 Church Street) – Good guys Gabe Lerner and Vincent Vitek will be serving up libations Drunken Dragon style. Ward III (111 Reade Street) – Consummate hosts Kenneth McCoy and Abdul Tabini with young guns Mikey Diehl and Dustin Olson will be making bespoke cocktails for your pleasure. Rum House (228 West 47th Street) – Old pros Nino Cirabisi and Abel Rodriquez joined by young buck Eric Job will be cranking out libations for the Times Square crowd. Stop by for a drink and the live piano. Mayahuel (304 East 6th Street) – Phil Ward’s cantina and agave mecca is fully operational with Jeremy Oertel and Jordan Brower holding the fort on Saturday July 20th with Jordan Bower and Natasha David covering tags the rest of the week. The Dead Rabbit (30 Water Street) – Jack McGarry & Sean Muldoon assure us that they have a deep bench and it will be business as usual at the Financial District cocktail destination. Expect signature punches, toddies, slings, and a encyclopedia of clever cocktails. Amor y Amargo (443 East 6th Street) – Barman Sother Teague is flying up a ringer from Atlanta, Mr. Ari Form makes his triumphant return to NYC. Get your bitters and amaro fix on! So get out there and support your local NYC cocktail bar! The show must go on!